Money is the medium of exchange and store of value. People describe it variously as bank notes, currency notes or simply “money”. But for the purpose of this piece, the description as “money” is chosen for prompt and lucid understanding of man and woman in the street. Bank note is the paper money that is issued by a Bank. The issue of notes in most countries is either entirely confined to or subject to strict control by the Central Bank. Currency is another name for money. A country’s own currency is that for internal transactions. Foreign currency is the money of other countries. In this country, the currency that is in circulation is “Naira”. The buyers shall insist that the bad Naira notes must be accepted by the sellers on the premise: “It was given to me by a Nigerian. Besides, I carry no other notes with me.” In the course of these continual and fruitless arguments, three possibilities may emerge-the seller may not part with the commodity. This does not enhance good trade and economic growth. Both the sellers and the buyers are at losses. The products may remain unsold. The buyers may lose the desired utility that is derivable from the commodity. A scuffle may eventuate between the buyer and the seller. These are not beneficial to the society. Therefore, the Federal Government, through its Central Bank, must opt for the plausibility of regularly printing fresh currency notes for people’s commercial transactions. This writer considers clean money to be one of the economic mirrors of a country. If the notes are clean, it shows that the economy is good; if it is dirty as it is now, it demonstrates that our economy is seriously sick, requiring surgical operation. By the way, if I may inquire: “Are our Federal Ministers not in receipts of these dirty notes? Are the members of the National Assembly blind to the abysmal conditions of these dirty notes? Is it not a shame to the Federal Finance Minister to find in circulation absolutely wretched Naira notes?” These dirty Naira notes are a disgrace to the nation. Some years ago, Nigerians were condemning tattered national flags flying in public places. Today, we are criticizing mutilated Naira Notes. It seems that our leaders are in love with things that are in tatterdemalions. It is a pity! Why are the conditions of our Naira so revolting? This writer can ascribe some reasons for these. People are in the habit of rejecting these notes. But quite often, I point it out to them: “When it was in mint form, the same people made it dirty as it is now, because of the wrong style that it is handled. Invariably, rough handling contributes to the filthy appearance of our money”. For example, the market women and the bus conductors are guilty of this. It is typical of the market mummies to stock decent notes inside their brassieres, corsets and corse-lettes for keeps in the course of their trades. In that process, body perspiration moistens the naira notes. Likewise, some young men tuck naira notes inside their pairs of socks, and even their pants ostensibly for security, but in reality they are vandalized. To worsen it, some write their names and address on the notes, thinking that in course of time, the money shall return to them after a certain period of circulation. Also, some superstitious folks nip the edges of the notes believing that no spirit shall steal them from their possessions. Further, the quality of the materials used to produce our naira notes are inferior. In 2015, many of these notes that were printed and sent into circulations have today peeled off as the inscriptions are deleted and illegible. The N50, N100 and N200 denominations are the victims of this vandalisation sparing N500 and N1000 the blushes. Moreover, the Federal Government’s habitual tardiness in re-printing the notes renders them defaced and lose their original artistic beauty. That is the aesthetics. It costs money to mint and print money. Therefore very significantly, the perennial delay in passing the Annual Budget by the National Assembly may possibly contribute to the Federal Finance Ministry’s prevailing predicament. Lastly, in this country, there is too much pressure on cash, with less emphases on bank cheques for transactions. In my considered opinion, I believe that it is because of the predominantly illiteracy level which results to lack of confidence in cheque transactions. In other words, people more often than not, rely on the uses of cash and less on cheques. This creates the mutilation and filthiness on the lower denominations of naira notes. With a pang of nostalgia, this writer remembers the colonial Nigeria era, to Tafawa Balewa administration when Chief Festus Okotie-Eboh was the Finance Minister, Nigerians were enjoying clean bank notes, compared with the present. At the introduction of new notes, a song was composed: “Okotie-Eboh ko owo tuntun de; aiye ndara bowa o e”, meaning, “Festus Okotie-Eboh has issued fresh and new currency notes; the country is assuming better economic era” Chief Festus Okotie-Eboh was a colourful politician in his days. He had the peculiarity of buoyancy in appearance and equally demonstrative in his gait that at any social milieu, the wrapper round his waist would be flowing behind him with the trailing tail held on by two youngsters. In the like manner, the currency notes, produced for circulation by his Ministry, were typically spick-and-span and undefaced. Today the exercise has detracted from what obtained in the days of yore. This writer is authoritatively informed that some banks are rejecting the mutilated money. The Finance Minister, Mrs Kemi Adeosun, must prove equal to the task of furnishing Nigerians with clean Naira notes, about which the quantities in different denominations cause inadequate balances (that is, change) for buyers and sellers. From the foregoing submissions, what is clear writer is advocating is that Nigerians deserve clean Naira notes, instead of the present sellotaped “rags” that pass for money. Oshisada, a veteran journalist, wrote from Ikorodu, Lagos. The Central Bank of Nigeria (CBN) has directed Deposit Money Banks to suspend charges on over-the-counter or ATM withdrawals of above N500,000 or deposit of same amount. The apex bank’s Director, Banking and Payments System Department, Mr Dipo Fatokun, in a circular dated April 20, 2017, said all the charges introduced in February, and meant to take effect from April 1, 2017, have been dropped. “For further clarification, the existing policy prior to the announcement of the new policy as earlier implemented in Lagos, Ogun, Kano, Abia, Anambra, Rivers states and the FCT shall remain. “For the avoidance of doubt, the old charges to be reverted to are as follows: Individual charges on withdrawals or lodgment limit is now three per cent. “Corporate accounts will be charged five per cent for withdrawal or lodgment of over N3 million cash. “Henceforth, nothing will be charged as processing fees for lodgments,” he said. Fatokun directed banks to make all necessary refunds to customers with immediate effect. The News Agency of Nigeria (NAN) recalls that the CBN in February announced its plan to extend the Cashless Policy to all the remaining states of the Federation by Oct. 1, 2017, to enhance the efficiency of payment systems. This policy, which received a lot of backlash from market analysts, was to commence in phases within the country with effect from April 1, 2017. The policy introduced charges on the cumulative cash withdrawals or deposits per customer per day, irrespective of the channels used either over-the-counter or ATM. The charges for individuals was two per cent for withdrawals above N500,000 to N5 million, 1.5 per cent on deposits for N500,000 to N1 million, and three per cent on deposits above N1 million to N5 million. Also, individual withdrawals above N5 million was to incur a 7.5 per cent charge. Similarly, corporate accounts were also to incur a charge of two per cent on withdrawals ranging from N3 million to N10 million, while withdrawals of that amount would be at a five per cent charge. Over-the-counter deposit of above N10 million to N40 million was to attract a three per cent charge and 7.5 per cent on withdrawals, while above N40 million attracts five per cent on deposits and 10 per cent on withdrawals. However, the policy exempted Revenue-Generating Accounts of the Federal, State and Local Governments, Ministries, Departments and Agencies of Government from cash deposit charge. The rate of naira counterfeiting is less than one per cent, the Central Bank of Nigeria (CBN), has said. In a reaction to a widely publicised report alluding to wide range naira counterfeiting of about 20 per cent, the Acting Director, Corporate Communication of the regulator, Isaac Okorafor, said nothing can be further from the truth, saying those parading that line of information were grossly uninformed. In a statement yesterday, Okorafor said: “While we acknowledge that no currency in the world is immune from counterfeiting, we make bold to state that the rate of counterfeiting in Nigeria has been very minimal due to appropriate policies put in place by the Bank. Indeed our records at the Bank clearly indicate that the prevalence of counterfeit notes in Nigeria from January to December 2016 was less than one per cent (0.0014%) or 14 counterfeit pieces out of one million bank notes. A former Deputy Governor of the Central Bank of Nigeria (CBN), Dr. Obadiah Mailafia, yesterday made stunning revelation that 20 per cent of the total currency currently in circulation in Nigeria was fake. Twenty per cent of currency circulating in Nigeria is fake; you can’t bring down food prices if you have fake currency circulating,” he said. Mailafia made the revelation while speaking at the opening session of a three-day public hearing on the 2017 budget, taking place at the National Assembly in Abuja. The public hearing, which the National Assembly said would help increase efficiency and transparency in governance, is anchored on the topic, “Public Finance in the Context of Economic Recession: Innovative Options. 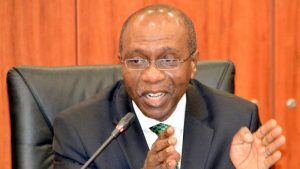 “The former CBN governor lamented that relevant authorities appeared to be ignorant of the dangers of fake currency in circulation, warning that such development was highly detrimental to the growth of the economy. He described recession as a situation where the gross domestic product (GDP) output falls more than two quarters while describing depression as the situation where GDP growth falls for more than five, six, seven years. Mailafia attributed the current recession in Nigeria to many factors such as global fall in the prices of crude oil, dwindling foreign reserve, weakening of the naira, negative growth and existing gap in public policy. He also listed other factors to include poor banking practices, stock market crisis, speculations, regulatory failure, corruption and fraud, and weak macro- economic management. Mailafia also warned against increasing tax, suggesting that the federal government should rather drive for more income tax by getting more people to pay instead of increasing it because it would further compound growth and investment. He told the Muhammadu Buhari administration to stop blaming the recession on past governments or other factors, insisting that such excuses were not tenable because the buck stops on his table. Consequently, the exbanker advised the legislature and the executive to capitalize on the current budget process to stimulate the economy, focus on factors that could rejuvenate growth, stabilise the exchange and interest rates and provide a stimulus package that would ensure a synergy between the economic growth and budget package. He carpeted the CBN for allowing the MMM initiative to operate in Nigeria, stressing that the development could be further detrimental to the recessed economy. He said that Nigerians’ involvement in the Ponzi scheme was risky for banking business. Mailafia also advised the government to reposition key institutions, invest in key infrastructure that could create employment to teeming youths on the streets, re-invent railway operations and reduce taxation. In a similar development, Dr. Nazifi Darma of the Department of Economics, University of Abuja, blamed Nigeria’s stagnant economy on lack of development plans by successive governments. While making a presentation on behalf of the Minister of State for Budget and National Planning, Mrs. Zainab Ahmed said the 2016 budget failed to achieve its target because the GDP growth fell from below 4.39 per cent target to 1.55 per cent. She also said that the budget made abysmal performance as a result of production volume, which fell from targeted 2.2 million to 1.81 million; inflation rose from projected 9.8 per cent to 17.8 per cent; exchange rate depreciated from projected N197 to $1 to N305/$ and revenue target of 3.8 per cent only produced 2.117 per cent. Minister of Budget and National Planning, Senator Udoma Udo Udoma, who later arrived the venue of the public hearing, said that in line with the submission of Mailafia, the government had no plan to increase tax and VAT rates, but rather seeking to broaden collection base. Also, during the budget public hearing, a coalition of civil society organisations, the Citizen Wealth Platform (CWP), revealed that it had uncovered some wasteful expenditure proposals in the 2017 budget by the executive arm of government, worth about N151 billion.